Most FM transmitters don't have "Auto Scan" function which will help find a vacant frequency automatically to avoid using occupied channel. The channel occupied would generate Radio Frequency Interference (RFI), which can be defined as an unwanted audible signal that invades the sound system via a radio frequency (RF) signal. Definitely "buzz" sound of RFI will ruin your music experience. Most FM transmitters would work fine when cigarette lighter's voltage outputs under 32V, but in some cases the voltage will spike to 40V like engine starts, battery issue, etc.. with which your device and car is in dangers! Ronxs FM transmitter functions with extra protections. The innovative design in the device, a replaceable fuse tube, can protect your device and car from damaging in the unexpected situations. Be safer! 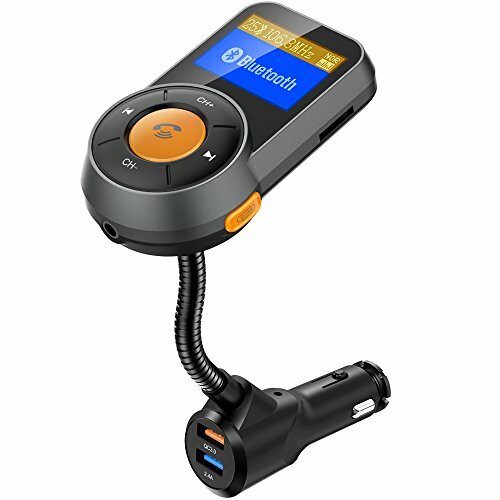 Ronxs Bluetooth fm transmitter also features an impressive frequency spectrum ranging from 87.5MHz to 108.0MHz. You can play audio through the USB, AUX jack, Bluetooth or straight from the device itself from a MicroSD or TF card. This has the "SWITCH OFF/ON" function. You can switch off/on the FM transmitter through long-pressing "SCAN" Button for 3 seconds. ❤ AUTO SCAN: Press "SCAN" button on this car fm transmitter to find vacant frequency automatically, which is the easiest way to pair channel with no radio interference. ❤ FASTER CHARGE: With smart QC 3.0 and 5V/2.4A dual usb charging ports, you can charge two devices at the same time with this car stereo receiver, smarter and faster. ❤ CRYSTAL SOUND: Noise Cancellation Technology (NCT) provides you crystal clear sound experience while streaming music, Ronxs BF22 car radio adapter also supports handsfree calling feature. ❤ INNOVATIVE SAFETY: Protected by the replaceable fuse tube, it keeps your car extra safer while using this bluetooth car adapter, even in case of voltage surges and spikes. ❤ BROAD COMPATIBILITY: Compatible with Bluetooth devices, for iPhone, iPad, iPod, smart cell phones or MP3 players, you can stream music to car stereo via Bluetooth protocol, 3.5 mm aux cord, and TF/ Micro SD card. If you have any questions about this product by RONXS, contact us by completing and submitting the form below. If you are looking for a specif part number, please include it with your message.